Where care and compassion meet on the sunny South Carolina coast!! Grand Strand Rehab & Nursing Center has earned its reputation for delivering medical care and compassion. Grand Strand Rehab & Nursing Center provides 24-hour skilled nursing care and offers short-term rehabilitative care. From nursing care to the full array of support services provided by licensed physical, speech, occupational therapist, as well as, the dietary and life enhancement departments, the valued residents of Grand Strand Healthcare know firsthand why they feel at home. 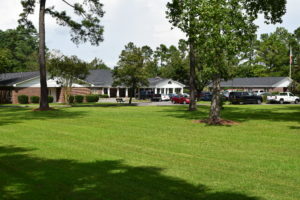 Set on 9.5 acres of beautifully wooded grounds, this 88 bed nursing facility, is just miles from the breathtaking sandy beaches and oceanfront that the South Carolina coast is known for. Our licensed nurses and therapists deliver around-the-clock care to your loved one, striving to meet their individual physical, mental and emotional needs. Our goal is to understand that your loved one is unique and, as such, faces very unique challenges, therefore, we strive to provide a quality of life is synonymous with quality of care.